Well, I adjusted & re-adjusted & fiddled with darts & played & played with the fabric version of this pattern (I took out an inch from the center front, for example)...and finally realized that it's too big. It's a 44, and I think I'm a 38. It doesn't seem like that much, but it is. And why didn't I pay more attention to the size? I'll tell you why...because I'm one of those lucky people who mostly fit into things: I'm average height, average width, etc. So I just assume things will fit. For example, the slenderette dress (Route 66), I didn't do any adjustment at all, just cut it out & sewed. I never even held up the pattern to see if it sort of looked right! And that fits perfectly...so I'm spoiled. However, this too-large pattern is definitely going to take some work to get this down to the right size. And I want to add a v-neck & a collar to this. Hmmmm. Am I even capable of that?! You can see from the photos (taken w/ my iphone--so no flash) that I've already taken out an inch in the front center, I also took out the darts in the front (I even had one on the armhole on the front) to try to start again. There are so many problems that I'm really rather stuck...for example, it hangs like a sack at the back waist. I'm guessing this is just a length problem? I think it would be good for me to learn this, but I'm not sure I'm up to it. I'll try to find a book tomorrow to help me thru that. So, along with a trip to the hardware store to pick out tile, paint, lights, etc. for the south wing, I guess we're headed to the library, too. I think this is my official excuse about why I don't finish as many projects as some of the other sewists in the blogosphere! 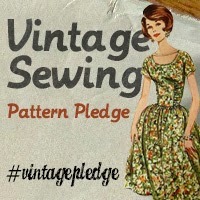 In the meantime, since I often can't sit & just watch a movie, I've been doing some surfing & discovered this page about re-sizing vintage patterns from So Vintage. Music?! Well, how about Autumn Sweater by Yo La Tengo? Okay, so I pinned & fitted & fitted & pinned the pattern (you saw those pics when I introduced Helen a few posts ago), and then I transferred my changes to the pattern tissue, and cut it out, put in the darts (only doing a few changes at a time--this based on reading I've been doing about using a dressmaker's friend & adjusting pattern pieces). And I'm not sure it's much better than the original pattern! I'm trying to figure out if I was too wimpy, or if the material I'm using for my muslin is the problem--it has a bit of stretch as it's poly-cotton. It's left over from a skirt I had made in Abu Dhabi, but it didn't work out too well: it had a lining, which always scooted way down, while the skirt scooted way up whenever I sat...leaving about 3-4" of the lining showing at the bottom. Very weird. But that explains why such pretty material is now a muslin for the Simplicity 7051 pattern. Another thing I wonder is if I should add the back, too. It's so hard to tell if I've pinned it all correctly, but adding the back would take out the seam allowances & let me see how it's pulled when there's a back on it. I'd love some comments with your muslin-fitting savoire faire! I did want to show you a few photos that we did take...not scanned in from postcards, which we also have many of. Anyway, this first one is a family we met in Otavalo, Ecuador in the early 90s. The Maldonados were great, so friendly (this was taken at their home, but we met them in the market). They gave us dinner, too! That's me on the left peeking out. The family's main source of income was the weavings the husband, Segundo, made, and which his wife sold in the market. Here's another photo of a woman spinning in Guatemala in 1997. It's not a very good picture...sorry. We tried to be polite when taking photos, and sometimes people just seemed irritated, or ignored us. You can see the combed wool to her left, turning into yarn on the wheel to her right. Magic! First, this is the medium model, but she's almost too big for me. I'm 5'8" & a size 8 or 10 (in modern sizes; probably 12-14 in old sizes) and I had to put all the dials to the smallest possible to get her to fit into my Route 66 dress. I decided that making her fit that dress, which fits me well, would be a good way to adjust my new dressmaker's friend (or, my imaginary friend!) without help from another seamstress. I named her Helen. Now I know Tilly doesn't approve, but I kept calling her a 'she,' and since I've decided she's a dressmaker's friend (not dummy) I really needed to name her. I told a friend at work & she said, "Well, give her a name of a guardian angel so she will be a protective force & won't go around killing people after dark." Great idea! I named her Helen...which was my grandma's name. My grandmother sewed a little, but quilted a lot & was great fun to have around, so it's a perfect name for my new friend. I did a bit more adjusting and believe I got the sleeve right. I took off the front pattern piece & marked all the adjustments on it, and will definitely cut it out & try it with fabric before I go any further. And finally, we are having a bed/bath added to our new home, so there are lots of contracting-type gentlemen tramping around our house, both inside & out. The first day I left her unclothed! I bet I scared a few of those guys! So I put my old hapi coat on her--I guess I learned more about modesty than I realized, living in the middle east for so long! 7501 vs 7051 - Details Shmetails! 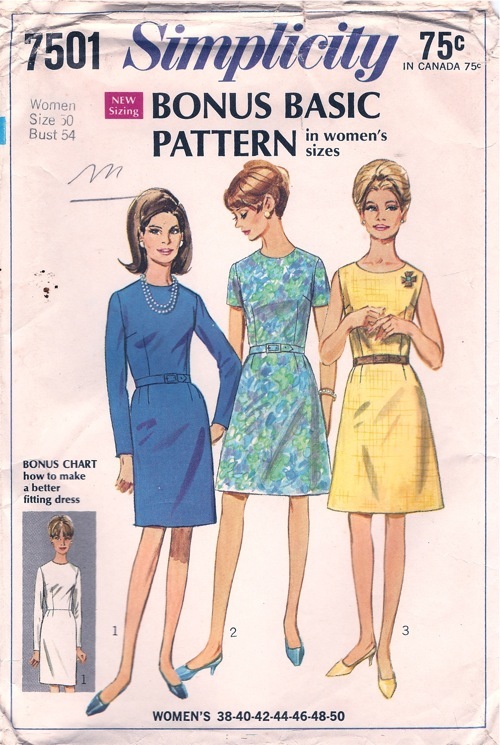 Okay, so you heard about my vintage pattern mix-up with SBT's lovely 1967 dress pattern in my last post. I remain undaunted, though, because I know I'll get a cool dress from 7501, and I may end up w/ 7051 anyway. I went to Hancock Fabrics today to try to find some dress-weight wool. They don't have much (they have more suiting-type wool for men & women), but I ended up getting a wool-poly blend. I think this will look great with my brown suede shoes! Very dressy. The lighter color is almost a peach, which doesn't show too well in the photo. It was hard to find something that wasn't plaid! I would have even taken a small-patterned plaid, but there were very few and none of them in a color I'd want to wear (I don't wear black--stopped at age 40). But then, I thought, well, why not make this pattern twice..and use this amazing narrow-wale all-cotton corduroy that's on a really good sale?! So here it is...I think it will be great; sort of dressy, but fun, too. It's also happy & brightly colored, but I think has lots of fall colors, so it works for the coming season quite well. I got extra because I may try to put on a collar similar to the one on 7051! I'll have to work up my nerve first. I also broke down & got a cheapo dress form. They were on sale and I've given up getting a Lady Valet to the US. I'll give this a try...I can always take it back if it's a real disaster. I'll show it when it's set up--maybe--she has to wear a bra & I don't want to embarrass her (or me). I'm refraining from naming her at the moment so I don't scare Tilly, especially at Hallowe'en time. At this point it's just an imaginary friend...you'll see her/it soon; I want to get her adjusted first! 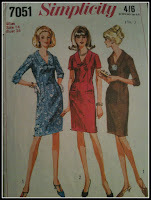 Simplicity 7051/7501 Vintage dress mix-up! 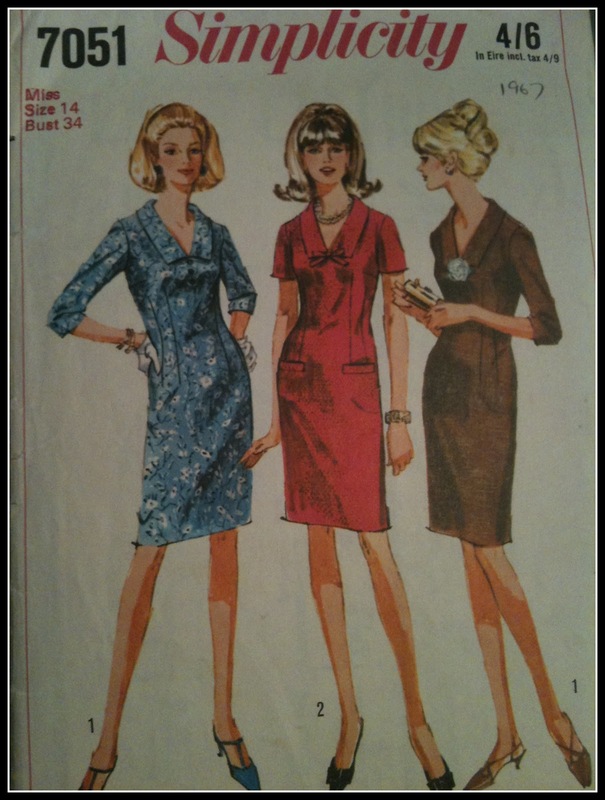 You may have read Scruffy Badger Time's post about Simplicity 7051 from 1967. I decided I needed that pattern, too. So I found it & bought it from Bonanza, and what a deal (about $8 with shipping). Looking more closely, I realized that I didn't have 7051, I had 7501! Yikes. Old age is hitting hard. So then I went back to the original post and realized that I didn't really like the pockets that much (well, I like them, but they will end up emphasizing my tummy--which is not a good thing). They're both great, and both from 1967...there's no way I would have got 7501 w/out Winnie's help, and I'll just have a different great vintage dress to make from light wool. And Winnie doesn't have to worry about me copying her! ;-) However, looking at 7051 again, I realize that I do love that neckline/collar...and the double darts in the front are so flattering. I will either have to try to modify 7501, or keep looking for 7051. I found these amazing "create your own country music outfit" coloring pages at the Country Music Hall of Fame. I like to give credit where credit is due, so I looked all over the website for attribution or links to these items, but no such luck. I've scanned these in, so print them off if you'd like to create your own country music outfit! While you're coloring, listen to what may be my all time favorite country song...Rocky Top by the Osborne Brothers. So, I finished it. Again, I need to reiterate how pleased I am about how well the batik (blue) goes w/ the Japanese poet print. You can see from the photo at right how messy my house is...NO! you can see that it is really a boxy Japanese kimono pattern, modified a bit to hopefully be a bit more flattering. However, there is so much bulk under the arms, at the side seams. I do like the final result & will wear it a lot (it's so loose that I can wear my pajamas underneath it easily)...but, I may try to think of a way to take in the side seams to reduce some of said bulk. I need to mention though, that kimono are not meant to be shaped, the pieces are rectangles made to efficiently use the narrow woven fabric. When we lived in Japan, one of my students was studying tea ceremony (the Japanese make everything an art & it always involves lots of study & practice)...and she had to wear a kimono. She told me that her kimono hated her! This student, Akiko, was a normal female shape, but she said that when you wear kimono, you have to have no shape. "Like the trunk of a tree," was how Akiko put it! Which surprised me, but if you think about it, she's correct (look at some photos from Kyoto, if you need more evidence). Which again brings me to the question of why I thought I would get a shapely housecoat if I copied a kimono pattern? Oh well...it was a fun project. A reminder, a yukata is a kimono, but made from cotton, not silk or wool. It's a summer kimono, essentially. If you've ever spent a summer in hot, muggy, Japan, you know why they invented this version of the kimono! Here's the back--you can see I added some darts in the back to give it some shape. I also added them in the front, but they don't show much because of the overlap. I had to look at the Roommate's yukata to figure out how to do the underarms. Attaching the sleeves was easy enough--just lots of straight line sewing, but after sewing up that little flap at the bottom of the sleeve, there's actually a gap in the fabric. I top-stitched that to make it lay smooth & look nice. I tried it on w/ my hapi coat belt, but the Roommate & I didn't think it looked very good, so I decided to make tie fasteners. There are 4 of them, and I'm also quite pleased with them--I made them by folding the fabric 4 times and sewing a few times--so they are rather sturdy & flat--and I think they make nice little knots. 2 are inside, where they don't show, so that the overlap stays put. One thing I kept coming up against over & over was how to fix it while it was on me. The Roommate is extremely helpful & willing to do most anything w/ regards to textiles & sewing, but he doesn't always "get" what I'm talking about. I really feel like a tailor's dummy, or dress form, or adjustable mannequin is the next item I want for my sewing room. I may have to wait a while--we have to pay for our new south wing, first! The duct tape version is looking better and better! Another issue...of course I don't have any matching pajamas! Uh oh. I do have some great stretchy fabric that sort of matches, maybe I'll make some pants out of that. I couldn't get a good shot of the one Wanda Jackson dress at the Country Music Hall of Fame, but here's an amazing video of her singing Hard-Headed Woman, which was playing on a loop (with some other great dancing stuff--Jerry Lee Lewis, Elvis, etc.). Look at her dress...and her dance moves really show off that fringe! She's still performing, btw here she is w/ Jack White on Letterman a while back, singing Shakin' All Over, and still wearing fringe. Go Wanda! If you need more music to get you thru this tour, here's Loretta Lynn singing another of my favorites, You Ain't Woman Enough (To Take My Man). I cannot resist that song. Ernest Tubb's guitars always had this on the back! Here's one of Ernest's hits, Drivin' Nails in My Coffin (Over You), a great example of Texas swing...find out more about Ernest, his record shops, the Midnite Jamboree shows, live from his record shops (there's an audio archive), or his 1970s tour bus at the Ernest Tubb Record Shops site. However, you'll see here that clothes DO make the country music star! The clothing at the Country Music Hall of Fame & the Ryman Auditorium was created by three artisans. Nudie, Manuel (who is still working--Jack White or Merle Haggard ring a bell?) and Nathan Turk. Follow the links to see more of their work. And, as always, clicking on the photo will get you the full-size version. If you look closely, you'll see that this suit on the right (with the musical notes on the sleeves) is the one he's wearing in the videos I posted previously: I Saw the Light and Hey, Good Lookin'). I don't think I can convey how much fun it was to see these. All I can do is recommend you head down to Nashville yourself; and don't forget to check out the Ryman Auditorium--there's a lot of great June Carter & Johnny Cash stuff there.